Early Beginner sheet music for piano, free! 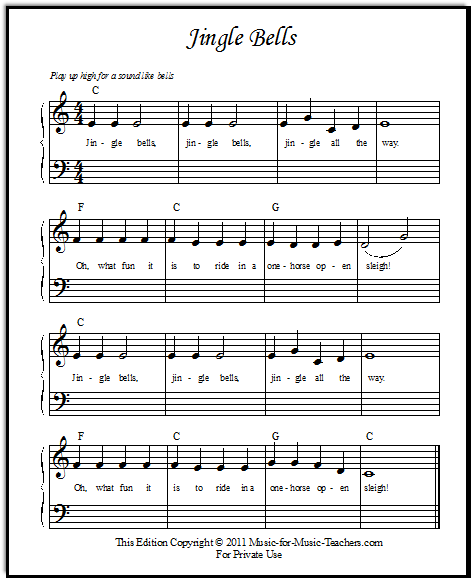 Sheet music for piano, free early beginner sheets. Paper keyboards, scales, chords, exercises, and simple songs that focus on the notes around Middle C.
These are the first things I use with my students! Three different printable keyboards are on this page. Each prints out on an 8 x 11 sheet of paper. These are a necessity for beginners, whether piano, guitar, or violin! Understanding the topography of the piano keyboard is the "Rosetta Stone" for musicians. Shown is the first set of scales, which help to shape the beginner's hand while gradually increasing finger independence. There is also a different set of scales on this page (not shown) to which my students progress after these ones. These super-simple notes train students' fingers to follow their eyes, up, down, or stay in the same place! Two little songs for extra practice on the notes around Middle C.
Perfect for your little beginners and even older beginners, who will strengthen their fingers along with their counting abilities. 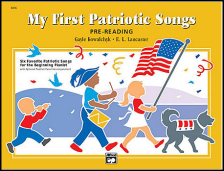 Lots of songs to choose from; your students will ask for a new one each week! 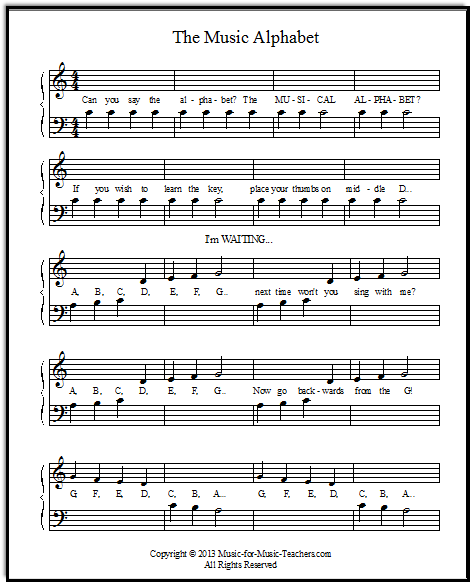 This fun song with goofy lyrics comes in several versions and arrangements here on my site. The simplest arrangements feature "helper notes" (letters inside the keys) and a partly simplified melody which uses only 5 notes, so that the hand doesn't need to move. Super-easy note-reading songs, just two notes in each. Both right and left hands want to play Middle C! "B" and "D" also get involved in the action. A Middle C song about the bear with no hair. Very cute, with "musical surprise" in the form of quarter rests! This one uses lettered notes, but there are other versions of Fuzzy Wuzzy on this page. This is the CHORDS, not the melody. After your students can make the second kind of scales plus chords, they will be ready to start this beautiful piece. Notice that the chord symbols are placed above the music, so there is no need to read the actual notes, if you understand the pattern. A huge favorite with my students. It does not sound like a beginner piece, but trust me, it is! Also available with AlphaNotes (notes with letter names inside the heads). Familiar songs are always rewarding to students. This tune is welcomed by starting students even in July! Not hard for a child who knows the tune. Only six notes, like Twinkle Twinkle Little Star and Lavender's Blue. Lavender's Blue, with the Cinderella song lyrics! Very popular with young girls, particularly if you share the Cinderella videos on this page with them! Your beginners will love getting music ready for Halloween! Especially for young beginners - a Halloween Songs set! These include some slightly scary songs, and others that just talk about candy, or costumes. This piece is essential (in my studio) for understanding the relationship of the I, IV, and V chords. VERY FUN. You will find some lettered notes in this version, pictured. 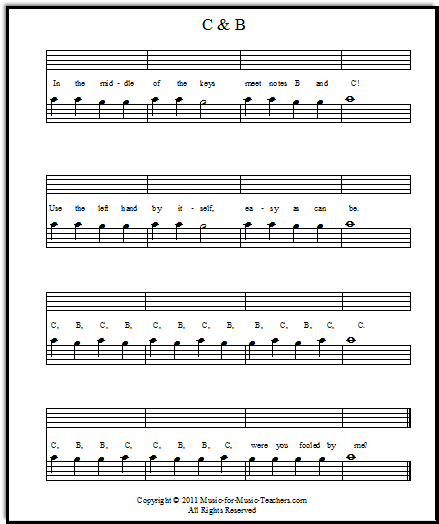 Students will transpose this, change it from major to minor, add chords to it, and use it as a foundation from year to year as they progress to new chord patterns. From A below Middle C up to G above, each note is played multiple times in a row, forward and backward, with words to sing along! The thumbs share Middle D instead of C.
Kids are happy to learn this famous song by Beethoven. Partly it is the familiarity of this tune, and partly, I guess, it's because it remains a great melody! This little song about chickens getting their breakfast stays very close to Middle C, moving step-wise in a predictable (but cute) fashion. Better known as "Hot Cross Buns", but these lyrics are more fun. Two kinds of scales just right for beginners. Four pages; treble clef and bass clef. Sharks - known as the "Jaws theme song" at my studio! This song has a familiar theme... very ominous-sounding, even with just three notes. This set of exercises is like "Wormies" but with lots more notes. Also called "Crickets Go Hopping", as a young students re-christened this page of exercises. A more complicated version of "Snakes," this exercise adds skips, first one, then two, then three, then four skips. Students enjoy trying to spot them! One slow note at a time, play up or down - or the same note again. With this page of exercises, you will KNOW if your piano student understands movement on the staff. Thanks for providing such a comprehensive music teaching program with all the relevant tools. It will make it easy to introduce my 8 g-children and others to music. You are truly a blessing. Hi! I'm teaching my little brother to play the piano and this is really helpful. Comments: Do you have a story or a question about music teaching? Share it!